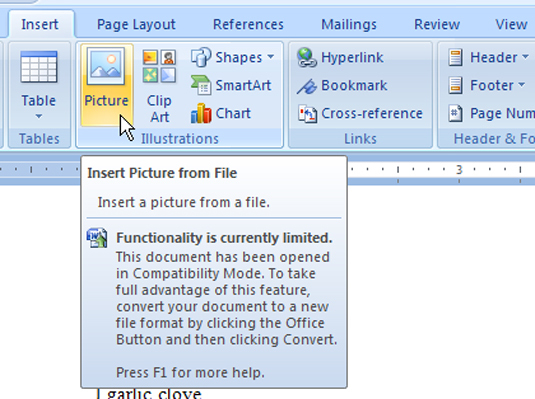 You can add a graphical image to your mailing labels in Word 2007. After making your label, either from an address list’s Merge fields or by just typing text, you’re ready to add the graphical image. 2Use the Picture button to insert the image. Click the image and choose Square as the text-wrapping option. Resize and position the image so that it’s completely within the first cell in the table. 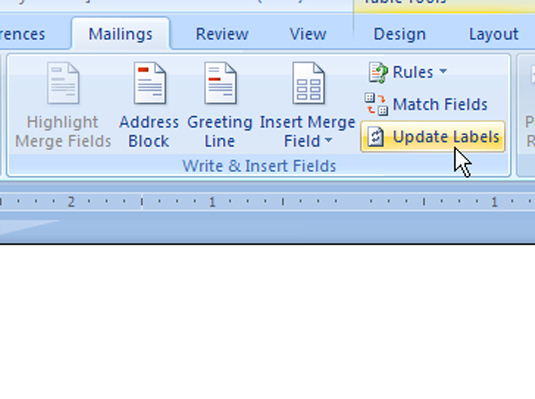 3When everything looks just right, click the Update Labels button on the Mailings tab. This populates the entire sheet, duplicating exactly what you’ve placed into the first cell — including graphics. You now need to get rid of those <<Next Record>> fields. 4Carefully select the text <<Next Record>>, including the angle brackets on either side. You have to drag the mouse over the entire thing to select it. 5Press Ctrl+C to copy that text. 6Press Ctrl+H to conjure up the Find and Replace dialog box. 7Click the mouse in the Find What box and then press Ctrl+V to paste. This pastes the text <<Next Record>> into the box. Leave the Replace With box blank. 8Click the Replace All button. At this point, Word may replace only the selected text. That’s fine: Click the Yes button to continue replacing throughout the entire document. Also click the Yes button if you‘re asked to continue searching at the beginning of the document. Click OK when the search-and-replace operation has been completed. 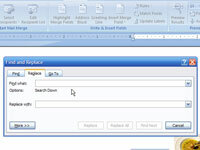 9Close the Find and Replace dialog box. All those annoying <<Next Record>> things are now gone from the labels.